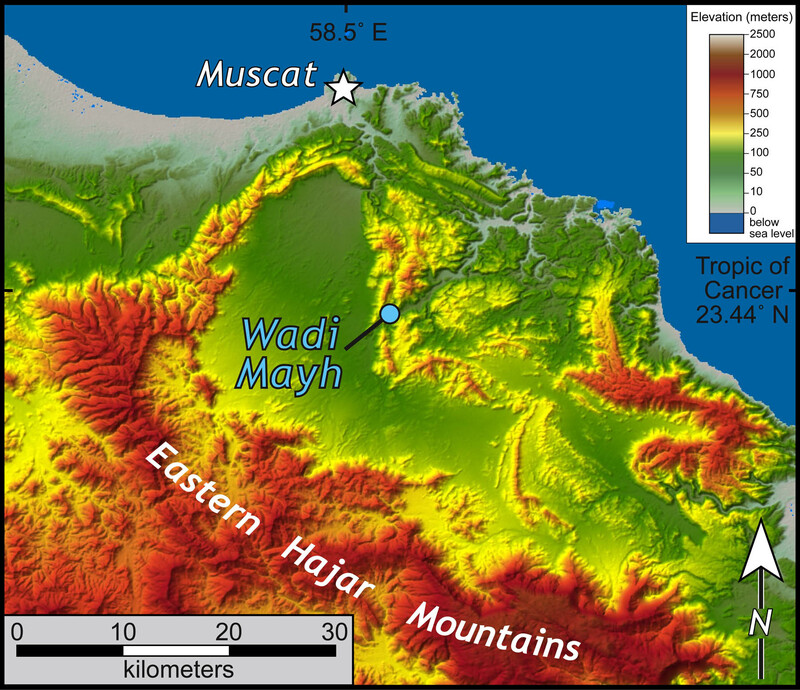 Shaded relief map of the Muscat area, Oman with Wadi Mayh highlighted. 30-m data from the Shuttle Radar Topography Mission. 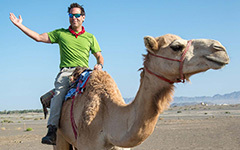 Oman is a sunny place and cloudy days are rather uncommon. On Friday, January 10th we awoke to cloudy skies over Muscat. Today was the day to tackle “the exposure” at Wadi Mayh about 25 km (19 mi.) south of Muscat. Wadi Mayh is a through-going drainage that offers tremendous exposures of bedrock in its channel and valley walls. The exposure we wished to see (and photograph) is a steep north-northeast facing slope rising 170 meters (~560 ft.) above the wadi. At this time of year the face is nearly always in shadow and the bright Omani sun backlights the scene making photography tough. I thought the clouds would provide just enough cover to mellow the lighting and result in a better picture. 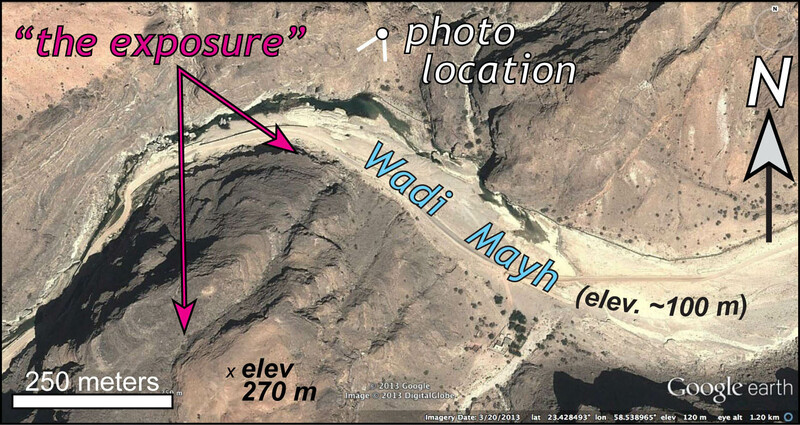 Google Earth image of the Wadi Mayh exposure, note its north-facing aspect. Alex Johnson and I climbed to a high perch across from the exposure and readied the equipment, but the sun refused to be muted behind the clouds. We waited patiently. There were moments of less sun, but we never got the lighting conditions we’d hoped for. Nevertheless, we put the GigaPan to work, taking a set of 56 images of the rocky face that we later stitched together into a seamless high-resolution image. What follows is the stitched image that spent some time getting ‘massaged’ in Photoshop to highlight this brilliant exposure and was then uploaded to the GigaPan website. Try zooming in to the image to see fine-scale details such as fractures, veins, and fold hinges. These gray limestones lack much contrast, but the layering is readily evident. It is difficult to appreciate the scale of the image. Recall the height of the exposure exceeds 150 m (500’); the best scale markers are near the bottom of the image, they are ~7 meters tall (23’) power poles. This is a huge exposure. In the view below (of the central part of the face), the rock almost seems to be smiling at the camera. Follow individual layers and you’ll find that they turn back on themselves and trace out a curious elliptical pattern. Clearly, the rocks are folded, but these aren’t your everyday folds. These are sheath folds, and mega-sheath folds at that. Close up of the central part of the exposure at Wadi Mayh, Oman, note bushes for scale. Lower image is a tracing of the layers wrapping around the sheath fold. 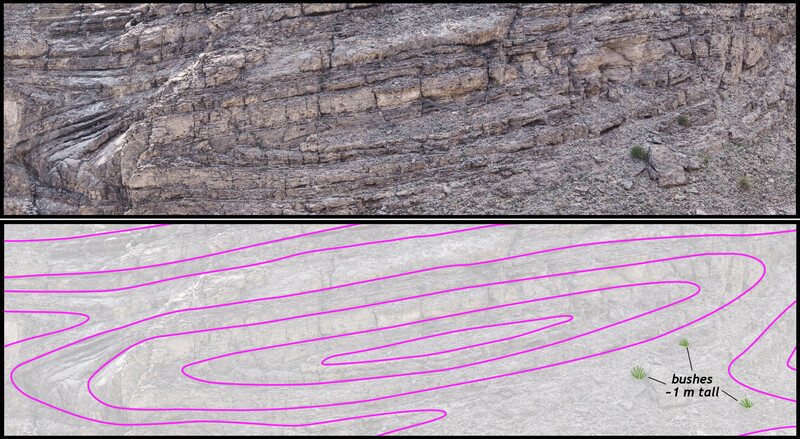 Sheath fold axis trends into the cliff face, approximately normal to the photograph. Sheath folds are distinctive curvilinear folds in which the hinge actually wraps around on itself. In three-dimensions sheath folds look much like their name implies, a sheath that might holster a sword (or in Oman, the traditional khanjar!). When eroded, the tubular-shape of a sheath fold displays a characteristic eye-shape in cross section—that’s what we see on the slopes above Wadi Mayh. Sheath folds were first recognized in the late 1970s and early 1980s, but, in my opinion, not properly appreciated until the 1990s. They form when layers are strongly sheared and early formed fold hinges are rotated into cone-like shapes; the long-axis of the sheath fold parallels the direction along which the rocks were most stretched. Schematic model illustrating the development of a sheath fold. Note distinctive eye-shape in cross section normal to sheath axis. In 2007 Mike Searle and Ian Alsop published an excellent article in the journal Geology on mega-sheath folds from the Wadi Mayh area. The sheath folds are developed in shallow marine carbonate rocks of Permian and Triassic age that are in tectonic contact with underlying high-pressure metamorphic rocks formed when the Oman ophiolite was obducted onto the Arabian margin. The folds in the photo are actually subsidiary folds of an even larger mega-sheath fold about 15 km in length! For me, sheath folds, regardless of the scale, dramatically illustrate that solid rocks are capable of flow, often in complex, but enticingly beautiful ways. 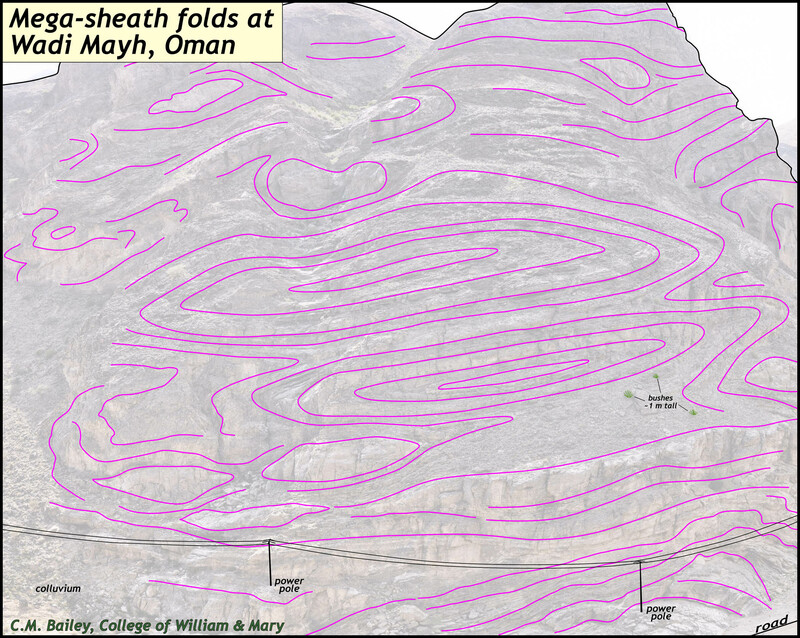 Annotated and traced image of the sheath folds at Wadi Mayh, Oman.